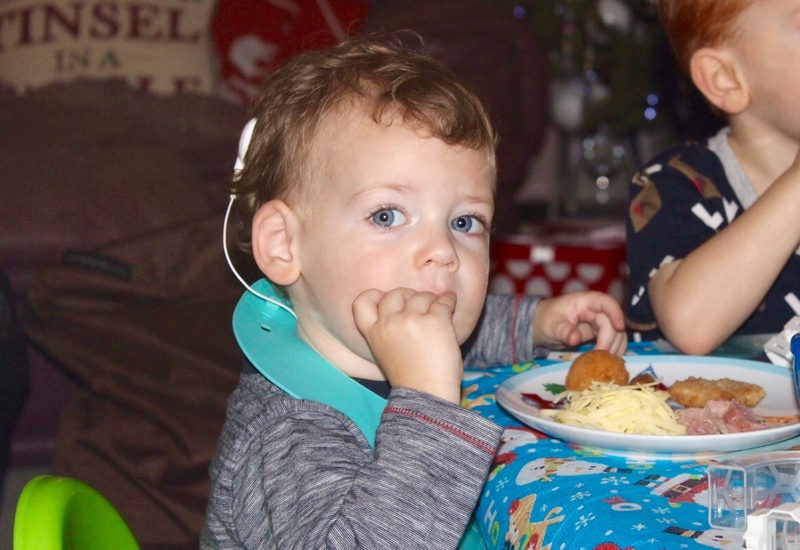 This is in no way a miracle fix in getting your fussy toddler to eat but its a few things we have been trying in our house to get a super fussy Harry to put anything other than “beige food” in his mouth! Harry eats pretty much anything his childminder puts in front of him and I was started to feel like I was being duped! Why would he eat it there and not at home?! What was I doing wrong?! I decided that after the Christmas pig out, I would put a plan into action and get him eating some of the things that he should have been eating. Before I give you some tips to try yourself please remember that I’m not an expert, proffessional, i’m just a mum doing what she can to get some nutrition into her kid! its my way of doing things and its working.. for now! So first things first, I think a big part of Harry not eating properly (especially at his evening meal) was snacking. All of a sudden he was signing and talking to me and tell me that he wanted to eat, and in the excitement of this I was letting him graze CONSTANTLY. I didn’t realise it at first but then I started to write down the half biscuit here and slice of toast there and realised I was giving him far too much food bribery in between meals, so he wouldn’t be particularly hungry enough at meal times to even contemplate eating it. Getting Harry involved in the prep and cooking process of meal times has been a massive help when it comes to getting him to try new things. I know what you’re thinking – MESS! and yes. it can be messy and it can take you twice as long to peel those potatoes and stir the pasta but I really think its so important to let your little ones get involved. I let him handle a knife with my help to chop up all the vegetables and give him a slab of cheese and a grater and the kid is on cloud 9!! He is much more likely to eat his dinner if he has helped me make it plus when he’s chopping up things such as carrots he tends to have a few nibbles here and there which is getting some goodness into him before he’s even got to the table! Its also such a learning game, we name everything we’re using he gets to feel the different shapes and textures of the food and when he’s bigger hopefully he will be learning how to cook! Harry pretty much decided himself that he would no longer partake in sitting in his highchair. Luckily for us we have the amazing Stokke Steps system so all we had to do was remove the baby seat part and he has a fully fledged chair that is the perfect height for table, and still has sides to ensure he can’t topple out. It was then that we realised that we very rarely (OK never) sit at the dining room table and Harry doesn’t see us eat our meals often so perhaps we need to start sitting with him and eating together. It has helped so so much! I think it gives him a sense of independence being out of his highchair and technically free to get down and roam around and seeing us eat what he is eating is helping him to understand that this is what people do! Instead of prepping something separate for him I usually give him exactly what we are having, even all the veg. Usually he will completely ignore the vegetables but sometimes he will have a few peas or we can hide them in a few mouthfuls. I think the key is to provide a vegetable on their plate every single time so they get used to seeing it there and will inevitably try it! All the emotions. Lock them up!! If Harry refuses to eat his dinner or pushes his plate away we simply say “no don’t do that” or “eat your dinner” and if the answer is still no then we say “OK, time to get down” – which is usually met by a screaming fit, tear, head banging, the lot, but we remain complacent and calm and we refuse to get angry with him. This shows him that he can’t get what he wants just by kicking off and 9 times out of 10 it works BUT only if you stick to your guns. You simply must be consistent as if you show any signs of weakness then they will get you in that kitchen and dishing them out all the toast and yoghurt!! It sounds a bit harsh but unfortunately discipline has to come into play when it comes to eating and we have found this the best way to do it. Remember they are not going to let themselves starve and they do give in eventually and every day gets a little bit easier. Yes, we do have slip ups. Days where we are at social events or days out and food bribery is the only option! We also aren’t particularly strict about Harry using a fork and spoon, to be honest if he’s shovelling food in with his hands then i’m happy for now! Manners can come later. I also don’t mind having the TV on whilst he eats if he asks for it. Sometimes I find the less focus there is on the food the more likely he is to just eat it whilst happily watching his favourite Princesses on Frozen! I never thought I would be so happy to see someone eat ONE pea but honestly it felt like all our hard work has been paying off!! Its still early days for us and our fussy eater but I have managed to get him to eat so much more than he was eating before. Do you have a fussy eater? What are your top tips for getting your fussy eater to EAT!?? I'm so pleased to read this! My 2.5 year old is such a nightmare and I think its definitely just a control issue! I find myself meal after meal running after him with the fork saying 'just one bite!!!' And it's exhausting!! !